The research is clear. People who have a high level of Health Confidence experience fewer adverse healthcare outcomes than people with a low level of Healthcare Confidence. But what is Healthcare Confidence? Health Confidence is a measurement of your ability to understand, manage and control most health problems with little to no anxiety or angst. Those with high confidence may still have many health concerns, but they generally feel they are getting good information, have good support, and know how to access the healthcare system when needed in a meaningful way. Those with lower degrees of confidence tend to be “not so sure,” may have poor access to care, or may find that the quality of information they receive could be better. It’s also important to understand what Health Confidence is not. Health confidence is not about gimmicks or quick fixes. It is an ‘inside-out’ approach with decades of proven results from thousands of people. Our practice is focused on person-centered, collaborative care. As such, we look at the root causes of our patients’ health concerns. Our experience has shown a direct link between our patients’ health concerns and their health confidence. In short, those with high confidence feel better, manage their conditions better and save money on their care. Do you feel you are getting the best care; exactly when and how needed? Do you feel you are getting the best information; understandable and useful? 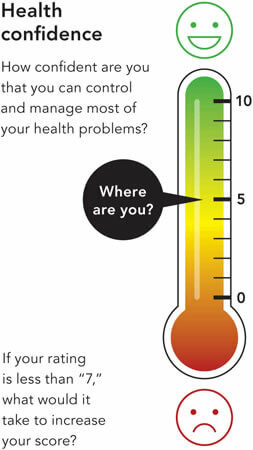 Do you feel you are very confident in your ability to manage and control most health problems? Click the link below to access a secure, free tool to help you on the road to the best health confidence possible. We encourage you to explore this site in detail and take advantage of the variety tools presented. And then share your findings with us, letting us know how we can help you. For those interested in learning more about health confidence in clinical practice, check out these links and references.